Do you need more guidance in Learning, Advocating, and Training? 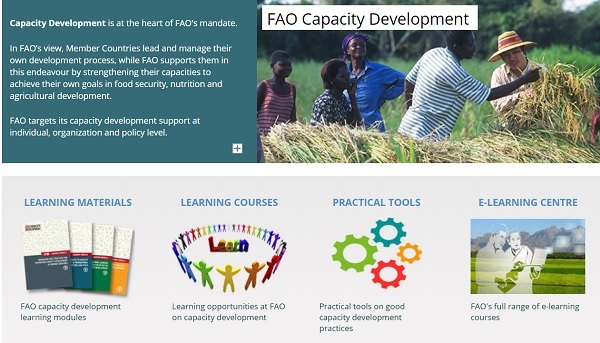 provide useful and insightful learning material for people engaged in Capacity Development activities at country level, as well as concrete information (rich with tools for practitioners) on how to implement FAO’s approach to CD. The terms 'Capacity building' and 'Capacity development' (CD) are used in numerous contexts to describe a wide array of activities. In the most general terms, capacity consists of a party's ability to solve its problems and achieve its objectives, while CD aims to strengthen parties' ability to work together for their mutual benefit by providing them with the skills and tools they need to define problems and issues and formulate solutions (ability to solve problems is more important that the problem itself). The above cited FAO’s LEARNING MODULES (LM) FOR CAPACITY DEVELOPMENT define CD as a long-term process that builds gradually around target AUDIENCE needs, CLEAR OBJECTIVES and PATTERNS to BE UNFOLD incrementally across three CD dimensions or levels where an endogenous STRENGTHENING of existing CAPACITIES and assets occurs. ENABLING ENVIRONMENT (the context in which individuals and organizations put their capabilities into action, and where CD processes take place). Each of these three dimensions works interdependently with the others and influences the overall impact of a CD intervention. A multiple-level approach takes into account the relationships between these dimensions and allows for the possibility that the root cause of weak capacity at one level may be found at a different level. CD requires a holistic perspective, analytical view, continuing assessment and follow-up, and well-crafted external support. While planning CD activities strategically, it is also important to take into account appropriate TIMING, DURATION, and MODALITIES on the CD support. An FAO-specific tool for Assessing Capacities at the levels of Individuals, Organizations and Enabling environment could be very useful for the assessment purpose. Assessing CD processes is one of the key areas for learning based on well-defined CD objectives and needs, delivered activities, results and indicators. The assessment process per se is as important as the “product” of the assessment and should be seen as a learning and relationship building experience. CD assessment can help planning, design implementation, reflecting on outcomes of actions, moving better towards a vision and transformation, monitoring of future CD activities on an ongoing basis. The definition of CD adopted in the FAO Corporate Strategy on Capacity Development is “process whereby people, organizations and society as a whole unleash, strengthen, create, adapt and maintain capacity over time”. CD is a process of learning and change that countries lead to achieve their development goals. CD requires participatory capacity assessments to help put CD on the agenda and encourage dialogue with national stakeholders in a structured way. CD is not a technical process, quickly solved by transfer of knowledge, skills or organizational models. It needs long-term commitment based on trustful relationships and the willingness to co-create processes. This recognition drives the process of moving from small projects towards programmes, which provide the “space” for long-term engagement with a clear orientation towards intended outcomes and impacts. There is often neither linearity nor predictability in the unfolding of CD processes, because CD emerges from the interplay of several factors and their interaction with the context. Against this backdrop, CD can be seen as an evolutionary process in which the strengthening of individual and organizational capacities influence one another and the enabling environment in a self-reinforcing loop. CD is a long-term process that builds gradually and incrementally across dimensions, and that requires continued follow-up and well-crafted external support. ensure a real understanding of what CD and Experience Capitalisation means together for greater impact. Experience Capitalization for Continuous Learning FAO free e-learning course introduces the methodology and process of experience capitalization. It gives you guidance and tools to help you plan and implement your own experience capitalization process, and ensure its efficiency and effectiveness. commitment and involvement in the development and implementation of improved, enriched, enhanced activities and programmes enabling continuous learning and knowledge sharing. Towards Open Educational Resources (openly licensed & in open formats). OER materials are expected to be freely shared with “5R permissions”— they can be Retained, Reused, Revised, Remixed, and Redistributed. You are welcome to Sign up for AIMS news and follow @AIMS_Community on Twitter... And, thanks again for your interest !